Kindle Oasis 9th Generation 8gb Graphite Wifi No Ads! Home / Refurbished Kindles / Kindle Oasis 9th Generation / Kindle Oasis 9th Generation 8gb Graphite Wifi No Ads! This Kindle Oasis is in Grade B Condition. The Screen is scratch free. The Corners are slightly dented. Some other minor cosmetic wear. It is Wifi only, and it has no ads. Amazon’s 7” Paperwhite display technology with E Ink Carta and built-in light, 300ppi, optimized font technology, 16-level gray scale. 6.3″x 5.6” x 0.13-.33” (159 mm x 141 mm x 3.4-8.3 mm). Wi-Fi 6.8 oz (194g); Wi-Fi + Free Cellular Connectivity: 6.8oz (194g). Actual size and weight may vary by configuration and manufacturing process. None; fully wireless and doesn’t require a computer to download content. 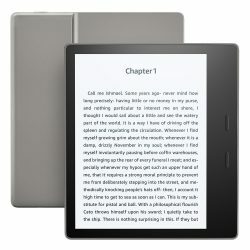 8 GB holds thousands of books or over 35 Audible audiobooks; 32 GB holds thousands of books or over 160 Audible audiobooks; Audible audiobook capacity based on average Audible audiobook size. A single charge lasts up to six weeks, based on a half hour of reading per day with wireless and Bluetooth off and the light setting at 10. Battery life will vary based on light settings, wireless usage. Audible audiobook streaming over Bluetooth will reduce battery life. Fully charges in under 3 hours from a computer USB, or in under 2 hours using the Amazon 5W charger (sold separately). Supports public and private Wi-Fi networks or hotspots that use the 802.11b, or 802.11g, or 802.11n standard with support for WEP, WPA and WPA2 security using password authentication or Wi-Fi Protected Setup (WPS). Advanced Audio Distribution Profile (A2DP) support for audio streaming from Kindle Oasis to your Bluetooth speakers or headphones. Audio/Video Remote Control Profile (AVRCP) support to remotely control playback of Audible audiobooks on Kindle Oasis from compatible Bluetooth devices. Bluetooth speakers requiring PIN codes are not supported.